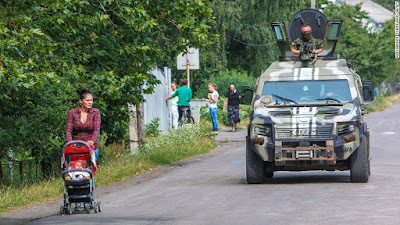 PISKY, Ukraine -- The war in Ukraine is not over. It's easy to think that it might be. If you walk around the Ukrainian capital of Kiev, or Lviv in western Ukraine, or even in Mariupol, just a 20-minute car ride from the front lines in Shyrokyne, it's hard to feel the war. Life is still going on as normal. People are still going out to bars and restaurants, movies are still playing, young couples are still getting married and students are still in class. Yet the war is not over. This summer the Ukrainian military decided to allow, for the first time, embedded journalists within the regular army -- a unique opportunity to have a raw look at the conflict with Russian-backed separatists that began as tension over a trade deal and became the annexation of Crimea and fighting in the eastern lands that border Russia. I headed east to a checkpoint outside the industrial city of Donetsk, now a separatist stronghold, to meet up with the 93rd Brigade. On the way to the front lines at Pisky, I saw children swimming in a lake and was reminded again how different this is from the wars in Iraq and Afghanistan, where I served in combat for the United States Air Force. The war here is mostly contained to a buffer zone a few miles wide on either side of the approximately 200-mile-long (320km) front line. Occasionally, the war will spread, like when Smerch rockets hit Kramatorsk in February or when Grad rockets hit Mariupol at the end of January. A ceasefire was signed February 12. Since then the fighting has mostly stayed in that buffer zone but in towns and villages like Pisky, inside that buffer zone, it's war. When I saw it last month, Pisky was almost destroyed. Most buildings have partially caved-in roofs from artillery hits. Almost every vertical surface is pockmarked by bullet and shrapnel holes. And in the eight days I was there I didn't see one window that wasn't shattered. The fighting was practically nonstop, creating a constant background din of small arms and artillery fire. Day and night you could hear the buzz of separatist drones orbiting overhead. In fact, soldiers get nervous if an hour or so goes by without the sounds of combat. We joined the unit of reconnaissance soldiers, snipers and other specialists. Like most troops in Pisky, they live in the basement of an abandoned house where there's some refuge from artillery shrapnel and snipers. Inside the basement was a bizarre coexistence of pieces of the lives the men had left behind with evidence of the war. There were cards written by children hung next to Kalashnikovs on the walls. On bookshelves, Orthodox images of the Virgin Mary lay next to grenades. The outhouse and the shower were about 100 meters (yards) from the cellar and across a road. Beams of light came in at different angles from the bullet and shrapnel holes in the walls and doors. And outside was the ever-present threat of attack. Out on patrol, the scenes are reminiscent of images from the First World War, if on a smaller scale: trenches, destroyed villages and static, long-range warfare. Soldiers told me they hardly ever saw the enemy. Yet, at night they could hear them talking. And they saw friends being wounded and killed, yet they were not allowed to attack, constrained in what they were allowed to do. Psychologically, it's a tough war. There's no escape from the danger. You could die just as easily walking to the toilet or taking a shower as you could while out on patrol or in the trenches. You never know when the artillery is going to start, or when a sniper has you in his sights. And usually your chances of survival just depend on good luck and not being in the wrong place at the wrong time. To cope with the stress, some soldiers recreate the lives they've left behind. Nemo, a 38-year-old from Kerch, in Crimea, grows strawberries and has built a gym in a destroyed home. He's been on the front line for almost six months, and he reacts calmly and evenly when the fighting starts. Even with artillery falling, he's out every day cranking out sets of dips and pull-ups. Bohdan, a 25-year-old from Lviv who is always wearing a cowboy hat, tinkers with an old motorcycle, which reminds him of the one he has at home. Konstantin, 33, flips through photos of his wife Zhanna and their twin 13-year-old boys on his old laptop while he lies in bed at night. We suffered artillery attacks with the troops -- when all you can do is shelter in the cellar and hope the house isn't destroyed over you. You hear the sound of the shot, the whistle as the mortar arrives, and then the explosion of the impact. You hope it's over until you hear the next round... and the next. Worse are the snipers -- another human being looking at you, trying to kill you. And that's how the soldiers live out there in Pisky, every day. Some have been on the front lines for more than six months without a single trip home. Every second of every day they know they could die. They've seen it happen to their friends, and they believe it could happen to them too. They understand that this war is for real, and it is far from over.